I had a tiny bit of apricot butter left in the fridge and wanted to make glazed chicken with it. I did a version of this a couple months ago that was really, really good. This one is a more simple take on that though. The glaze isn't as thick as the previous one and it doesn't have as much apricot flavor. I just wanted a hint of flavor this time because my husband was home for dinner and he isn't an apricot fan at all, but the apricot was so subtle that he even liked it! 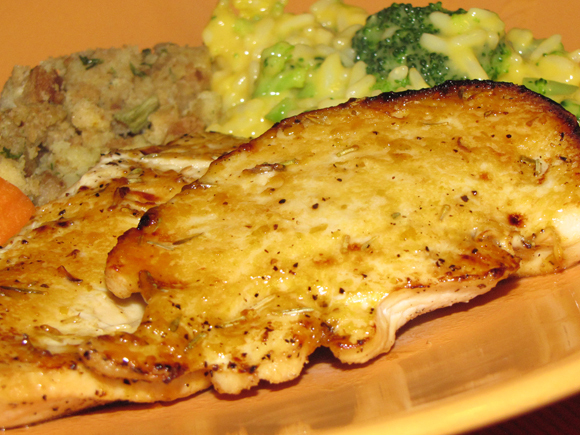 This glaze gave just a little sweetness to the chicken and the butter helped keep it moist. If you don't have apricot butter, you could use preserves or jam. It won't be as smooth and will probably be a little bit sweeter, but it will still have the same effect. 2. Mix glaze ingredients together in bowl and set aside. 3. Season chicken breasts with salt and pepper. 5. Broil on high for 5 minutes about 6 inches away from heat element. 6. Turn chicken over and spread glaze over each piece. 7. Broil for another 7-10 minutes or until chicken is no longer pink and nicely browned.